Lost in ISA Server 2004 Translations! 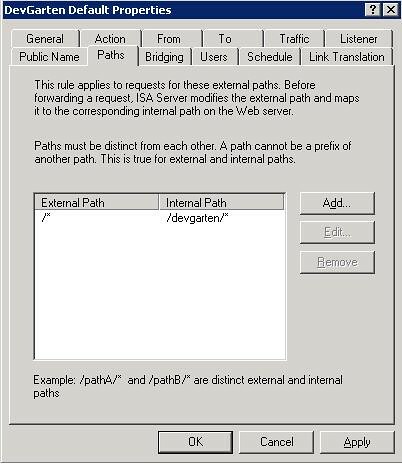 With Dev’garten, I have the actual ASP.NET 2.0 site hosted on a virtual server instance running IIS, and the actual web site is located under a virtual directory. 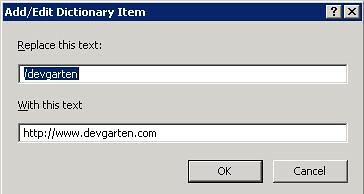 So, when incoming requests ask for http://www.devgarten.com, they get the virtual directory appended through the Path config, and when the web server is returning content to the client browser, the /devgarten folder path is scrubbed by the Link Translation config. If you forget one or the other, it’s all going to go a little funny. Also, make sure you have configured your host headers correctly on your IIS box too, or you’ll get host not found errors. Ahh, the adventures of the developer in infrastructure land 🙂 But I have to say, I’m liking ISA Server 2004 more and more every day!